Afridiziak Gifts and Occasions returns for the third year with their culturally inspired Winter Fair. We are excited to be holding our first Birmingham Winter Fair on Saturday, 1 December at The Drum and again in London on December 8 at the Electric Social in Brixton. Since 2010, Afridiziak Gifts and Occasions shopping events have attracted quality exhibitors showcasing the finest selection of merchandise including children’s toys; books; hair/beauty products; jewellery/accessories; art, greeting cards; clothing for men, children and women; and seasonal food and drink. Many of the items on sale have been naturally/organically produced and handmade. 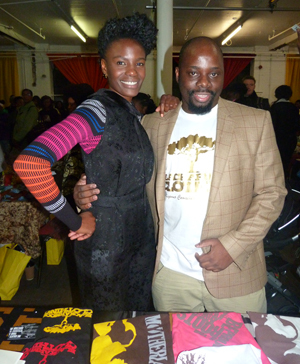 Celebrities spotted at previous events include singer Shingai Shoniwa [Noisettes], and Jimmy Akingbola [Holby City]. This unique shopping event brings together independent retailers and entrepreneurs selling culturally inspired gifts you won't find on the shelves of local high street shops or department stores and gives shoppers the opportunity to pick up inspiring gifts which ooze creativity. Charity: This year we have chosen the Sickle Cell Society as our official charity we will be donating a percentage of proceeds taken on the door from both events. Kalpna Patel, Sickle Cell Society: “The Sickle Cell Society is delighted to receive support from Afridiziak Gifts and Occasions through their Winter Fair event 2012. This fantastic event will help raise awareness about sickle cell disease amongst the local community. The funds raised will help us continue to provide information, advice, advocacy; raising awareness, welfare and education fund, respite care, annual children’s holiday, day trips, assist into research, hold talks, patient education seminars and training”. We are pleased to be working with the following organisations: Afridiziak Theatre News; the Sickle Cell Society; Blaze Up Entertainments, Calabash Hub and Gospel Essence Choir. Goodie bags and raffle prize sponsors including Miss Jessie’s. 1. For press enquiries – interviews with the founders of Afridiziak Gifts and Occasions; logos; images of some of the culturally inspired gifts that will be on sale on the day, etc please contact Sophia A Jackson on sophia@afridiziakGO.com or call 07855 86 77 78. 2. Exhibitors taking part in the third annual Afridiziak Gifts and Occasions Winter fair are available for interview. 3. Afridiziak Gifts and Occasions was launched in September 2010 by Deanne Rowe and Sophia A Jackson. We are all about unique gifts, which are culturally inspired by African-Caribbean culture, and we support entrepreneurs in getting their goods and services to a wider audience.